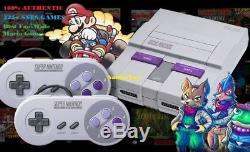 Super Nintendo Classic Edition System SNES - 325+ GAMES! 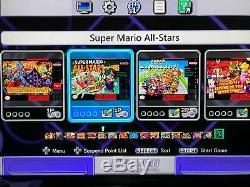 SNES Mini Console (with 325+ Games from SNES). Two (2) SNES Wired Controllers. USB Cable & AC Adapter. Original Packaging and Instruction Manuals. Turbo Reset - Press and Hold "Down + Select". All games separated by console type, then alphabetical order. All games come with original box art and saves. 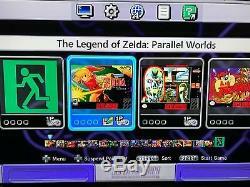 Comes with some of the best Fan Made Mario Games & Zelda Parallel Worlds (a remodel of the original game), 3 New FZERO Games, a new Metroid game. Games can be replaced with other games to your liking. Addams Family, The Pugsleys Scavanger Hunt. Adventures of Batman & Robin. Adventures of Rocky and Bullwinkle and Friends. Arkanoid - Doh It Again. Barkley Shut Up and Jam! Best of the Best Championship Karate. Boogerman - A Pick and Flick Adventure. Boxing Legends of the Ring. Brunswick World Tournament of Champions. Bubsy in Claws Encounters of the Furred Kind. Bulls versus Blazers and the NBA Playoffs. Captain America and the Avengers. Contra III: The Alien Wars. Daffy Duck - The Marvin Missions. Death and Return of Superman. Desert Strike Return to the Golf. Donkey Kong Country 2 - Diddy's Kong Quest. Donkey Kong Country 3: Dixie Kong's Double Trouble. Double Dragon V - The Shadow Falls. Dragon - The Bruce Lee Story. Dragon Ball Z - Super Butoden. Final Fantasy - Mystic Quest. Flashback - The Quest for Identity. Flintstones, The - The Treasure of Sierra Madrock. Great Circus Mystery Starring Mickey & Minnie. Hagane - The Final Conflict. Home Alone 2- Lost in New York. Jetsons, The - Invasion of the Planet Pirates. Joe & Mac 2 - Lost in the Tropics. Jurassic Park II - The Chaos Continues. Kirby's Dream Land 3. Legend of the Mystical Ninja. Lemmings 2 - The Tribes. Lufia & The Fortress of Doom. Lufia II - Rise of the Sinistrals. Magical Quest Starring Mickey Mouse. Magical Quest 3 Starring Mickey & Donald. Marvel Super Heroes - War of the Gems. Michael Jordan Chaos in the Windy City. Mickey Mania - The Timeless Adventures of Mickey Mouse. Might and Magic II - Gates to Another World. Might and Magic III - Isles of Terra. NBA Jam - Tournament Edition. Pac-Man 2 The New Adventures. Power Rangers Zeo Battle Racers. Prince of Persia 2: The Shadow & The Flame. R-Type III - The Third Lightning. Ren & Stimpy Show, The Buckeroos! Ren & Stimpy Show, The Fire Dogs. Ren & Stimpy Show, Time Warp! Ren & Stimpy Show, Veediots! Spider Man Venom - Maximum Carnage. 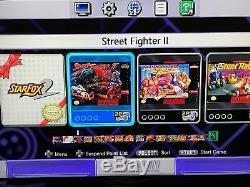 Street Fighter II Turbo: Hyper Fighting. Super Conflict - The Mideast. Super Mario RPG: Legend of the Seven Stars. Super Star Wars - Return of the Jedi. Super Star Wars - The Empire Strikes Back. T2 - The Arcade Game. Teenage Mutant Ninja Turtles - Tournament Fighters. Teenage Mutant Ninja Turtles IV - Turtles in Time. The Legend of Zelda: A Link to the Past. The Legend of Zelda: Parallel Worlds. Tiny Toon Adventures - Buster Busts Loose! Item will be packed with care. Message me with any questions. Thanks for looking and check out my other items. 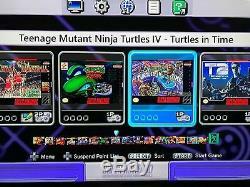 The item "Super Nintendo Classic Mini Edition SNES System Super NES 325+ Games MODDED" is in sale since Wednesday, December 5, 2018. This item is in the category "Video Games & Consoles\Video Game Consoles". The seller is "samustoys" and is located in New York, New York. This item can be shipped to United States, Canada, United Kingdom, Denmark, Romania, Slovakia, Bulgaria, Czech republic, Finland, Hungary, Latvia, Lithuania, Malta, Estonia, Australia, Greece, Portugal, Cyprus, Slovenia, Japan, Sweden, South Korea, Indonesia, Taiwan, South africa, Thailand, Belgium, France, Hong Kong, Ireland, Netherlands, Poland, Spain, Italy, Germany, Austria, Bahamas, Israel, Mexico, New Zealand, Philippines, Singapore, Switzerland, Norway, Saudi arabia, Ukraine, United arab emirates, Qatar, Kuwait, Bahrain, Croatia, Malaysia, Brazil, Chile, Colombia, Costa rica, Dominican republic, Panama, Trinidad and tobago, Guatemala, El salvador, Honduras, Jamaica, Antigua and barbuda, Aruba, Belize, Dominica, Grenada, Saint kitts and nevis, Saint lucia, Montserrat, Turks and caicos islands, Barbados, Bangladesh, Bermuda, Brunei darussalam, Bolivia, Ecuador, Egypt, French guiana, Guernsey, Gibraltar, Guadeloupe, Iceland, Jersey, Jordan, Cambodia, Cayman islands, Liechtenstein, Sri lanka, Luxembourg, Monaco, Macao, Martinique, Maldives, Nicaragua, Oman, Peru, Pakistan, Paraguay, Reunion, Viet nam, Uruguay.